Why it matters: While everyone was excited to hear about its latest flagship phone, the Galaxy Note 9 was not the only new product Samsung “Unpacked” today. It also unveiled an LTE-enabled smartwatch. The Galaxy Watch is Samsung’s answer to the Apple Watch 3. It touts advanced health and fitness capabilities and long battery life. It also stays connected even if you leave your Galaxy Note 9 behind by going through your cellular network. “At Samsung, we have a long history of providing consumers with choice, while maintaining innovation within our products, and we are excited to continue the proud heritage of our Galaxy line with our wearables,” said Samsung CEO of IT and Mobile Communications DJ Koh at Unpacked in Brooklyn, New York today. The Galaxy Watch comes in two sizes — 46mm and 42mm. The company claims the larger version can run for 80 or more hours with typical usage. The battery life in the smaller unit is significantly lower due to size constraints, but can still operate for at least 45 hours on a single charge. The Galaxy Watch supports LTE coverage from over 30 carriers in more than 15 different countries. This allows users virtually worldwide to leave their phones at home when they go to the gym. Untethered the watch can deliver messages, voice calls, GPS mapping, and streaming music. Some of the new wellness-tracking features it offers include a stress management app, a sleep monitor, and a fitness tracker. The stress app can detect high levels of stress and provide breathing exercises to help bring users back into focus. The sleep monitor can track all levels of sleep and give users feedback in adjusting their sleeping habits. The fitness tracker can track up to 39 workouts to bring variety into the routine. The fitness tracker also has a nifty little trick up its sleeve to help users watch their caloric intake. All you have to do is take a picture of your meal. The Galaxy Watch can then use “Bixby Vision” to log nutritional information on the fly. Better health through AI. 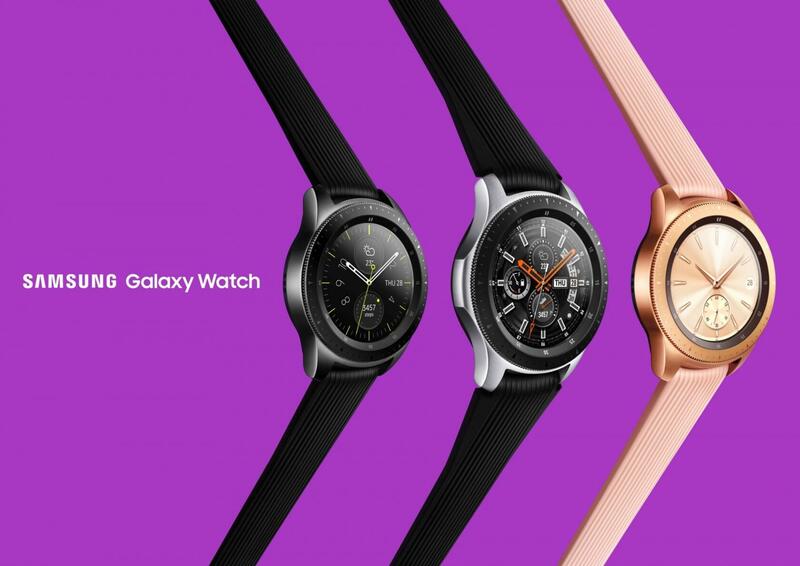 In addition to the two sizes, the Galaxy Watch comes in silver, black and rose gold variants. There are also a variety of watch bands to chose from, and of course the watch face is customizable — it wouldn’t be a smartwatch is it weren’t. Some faces are realistic, even incorporating shadow into the bezel. The devices can also be configured to tick and sound hourly chimes. "This means that both devices are safe to wear while walking in the rain or showering and may be used for shallow-water activities like swimming in a pool or the ocean. However, Galaxy Watch should not be used for scuba diving, water skiing, or other activities involving sudden temperature changes, high-velocity water activities or submersion below shallow depth. Rinse in fresh water and dry after use in sea water." Samsung plans a slow rollout of the device. The Galaxy Watch will first be available in the US at select carriers and retailer on August 24. It then releases in Korea a week later on August 31. Starting on September 14 the watch will begin launching in other select markets worldwide. The 42mm version comes in Midnight Black or Rose Gold and will retail for $375. The larger 46mm variant only comes in Silver and will sell for $400. Some carriers will offer financing plans with payments as low as $15 per month tacked onto their bill.